Updated by Steve Fraley, N.C. Wildlife Resources Commission. From May through July over sand or gravel in shallow areas with current. Males are territorial during spawning. At spawning, the male mounts the female. As they quiver, they simultaneously release eggs and sperm. The female produces up to 1,100 eggs, with a few eggs released during each mating. The mating process is repeated until the female releases all of her eggs. Unlike many other darter species, the tangerine darter does not care for its eggs. Juveniles are sometimes found in water that is calmer than the fast current preferred by adults. Males become mature at 1 year old, and females at 2 years. The typical length of a juvenile after a year of growth is 2 to 3 in. The tangerine darter is found only in the mountainous sections of the upper Tennessee River drainage. In the mid-Atlantic region, this includes western Virginia and western North Carolina. The darter also occurs in a small portion of northern Georgia and throughout eastern Tennessee. 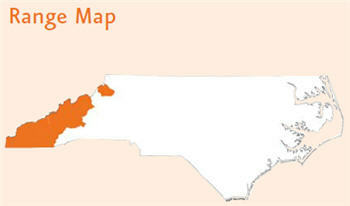 In North Carolina, the species is located in many counties within the Appalachian mountain region. Throughout its range, the tangerine darter’s distribution has been fragmented by reservoirs. Because of its restricted range, it is considered a species of conservation concern throughout its range, but it is common and abundant in many streams in western North Carolina. The tangerine darter reaches a maximum length of about 7 in. When compared to other darters, it is rather large and stout-bodied. And like many other darters, it is very colorful. The adult males are characterized by an orangish-red to tangerine color along their lower mid-sides and bellies, whereas females are typically yellow in color and juveniles are white in these areas. All specimens have 8 to 12 fused blotches along their mid-side that usually form a continuous, broad black stripe from head to tail. Above this stripe lies a row of small black dots that is unique to the species. The background for these dots is a dusky-yellow or olive color. The first dorsal fin of adult males is dusky and edged with orange, while females exhibit a yellow dorsal fin. The ventral fins for both sexes are dusky to black with breeding males exhibiting some iridescent blue. The tangerine darter lacks the black teardrop bar under the eye that is typical of most members of the genus Percina. Like most members of the genus, the tangerine darter has a frenum — a fleshy connection between the snout and upper lip. It also has some degree of enlarged scaling near its pelvic fins. 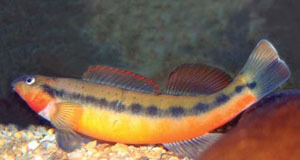 The tangerine darter is native to North Carolina, and it occurs only in the Ten nessee River drainage within the Appalachian mountain region. It tends to occupy large creeks and small rivers with clear water, which further limits its range and abundance. Because this species has a restricted range and inhabits specific types of waterways, the tangerine darter is currently on the N.C. Natural Heritage Program’s “Watch List.” The tangerine darter is not actively fished for by anglers and is classified as a nongame species. The tangerine darter occurs in clear, cool and warm large creeks and small rivers with moderate grade. It typically inhabits deeper riffles and runs with bedrock, boulder and gravel substrate for most of the year and moves into deeper pools in the winter. Females and the young are sometimes found in calmer water. Occurrence in sandy gravel areas may be only during the breeding season, primarily from May through June but sometimes into July. Typically, males mature by the end of their first year, and most or all 2-year-old females are mature, with their life span extending a little over 4 years. Spawning is keyed by water temperature and occurs on gravel riffles. Most of the spawners are 3 to 4 years old. During spawning, the female is mounted by the male; both quiver while simultaneously releasing eggs and sperm onto the gravel. This process is repeated many times until the female releases all of her eggs—typically 120 to 1,100. Unlike many darter species, the tangerine darter does not exhibit parental care. The typical length of a juvenile after a year of growth is 2 to 3 in. The tangerine darter is most active in the early afternoon and usually obtains its food from riverweed beds by nipping aquatic insects from the vegetation or substrate. Juveniles feed primarily on mayflies and midges and shift to caddisflies and mayflies as adults. Adults have been observed rolling small gravel to feed on exposed prey. Because the tangerine darter is a nongame fish, it rarely interacts with people. Occasionally anglers catch these darters by accident while fishing with small baited hooks or artificial flies. This strikingly beautiful fish is best seen by swimming with mask and snorkel. By swimming slowly and without sudden movements, you will be rewarded with a close view and an opportunity to observe its behavior. Keeping this large and demanding fish in an aquarium is best left to the most experienced aquarists. Casual collecting and attempts to keep it in captivity are discouraged. Like many of our native species, tangerine darters are sensitive to habitat degradation, such as excessive sediment. Following best management practices to reduce erosion throughout western North Carolina is vital to the conservation of this species. Status of the tangerine darter in North Carolina is tracked as part of routine regional monitoring surveys by NCWRC staff and partners. Tangerine darters are also part of our cooperative effort to restore fishes to the Pigeon River as it recovers from decades of severe pollution from a paper mill. 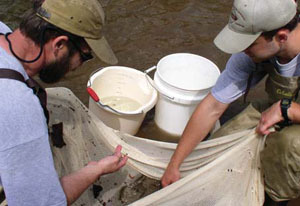 Tangerine darters are collected from the upper Pigeon River in North Carolina and used for captive propagation to help restore the species to the lower Pigeon River in Tennessee. Recent monitoring in the recovering reach of the Pigeon shows the tangerine darter population increasing in number and now occupying much of the 20-mile reach between the paper mill at Canton and Walters Reservoir. Etnier, D. A. & W. C. Starnes. 1993. The Fishes of Tennessee. Knoxville, Tenn.: The University of Tennessee Press. Jenkins, R. E. & N. M. Burkhead. 1994. The Freshwater Fishes of Virginia. Bethesda, Md. : American Fisheries Society. Page, L. M. & B. M. Burr. 1991. 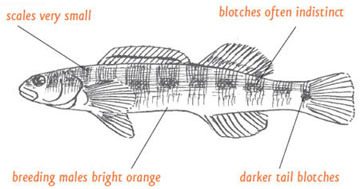 A Field Guide to Freshwater Fishes: North America North of Mexico. Peterson Field Guide Series, #42. Boston, Mass. : Houghton Mifflin Company. Rhode, F. C., R. G. Arndt, D. G. Lindquist, & J. F. Parnell. 1994. Freshwater Fishes of the Carolinas, Virginia, Maryland, and Delaware. Chapel Hill, N.C.: The University of North Carolina Press. Illustrated by USGS, Florida Integrated Science Center. Photos by N.C. Wildlife Resources Commission, darter on stones by J.R. Shute, Conservation Fisheries, Inc.
14 June 2010 | Fraley, Steve; Watson, Brian T.